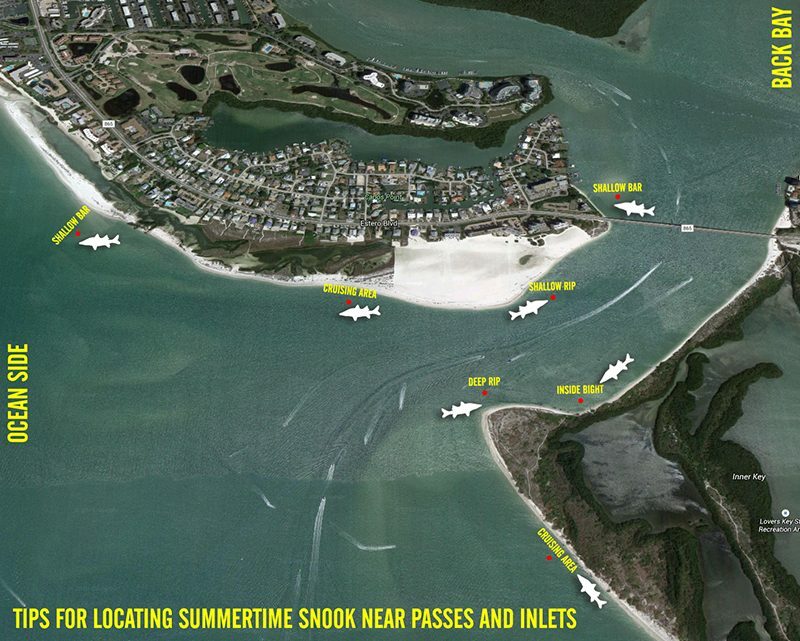 Locations: Finding summertime snook along coastal beaches can seem like a daunting task. 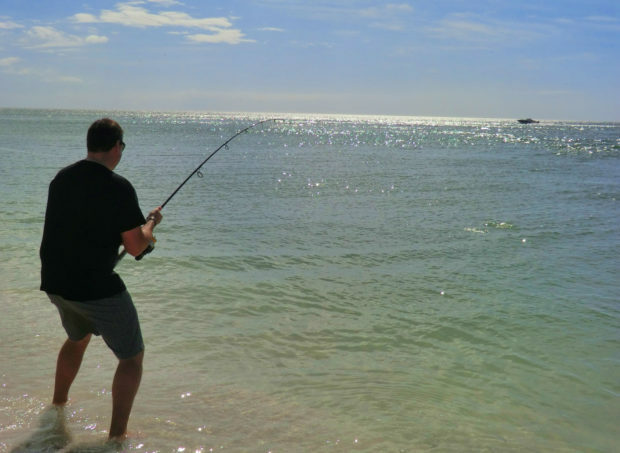 With seemingly endless miles of beach line, locating a productive starting point will put you on more fish in much less time. There are a few key features that concentrate populations of snook into predictable patterns. nes that provide access to winter backwater areas and abundant forage. You will frequently find larger groups of snook within a half mile of passes. These fish will move up and down the beach in search of pilchards, herring and mojarra. Fish the trough: It’s common to see beach anglers trying their best to cast as far away from the beach as possible. While this area does hold some fish, the majority of actively feeding fish will be running along the “wash” or trough that runs just a couple feet from the shoreline. This deeper area collects bait fish and the snook will use it as a highway to feed and travel. Effective presentations are made by casting horizontally in the trough and working your lure through the strike zone. Structure: Man-made structures such as docks, piers and jetties provide food and shelter which can concentrate numbers of snook. Fish will not only hold under the structure, but will commonly hunt adjacent troughs within a couple hundred yards of the structure, seeking refuge from predators under the structure at night. Bights/Bends: These less obvious geographic features generally receive less fishing pressure than easy to find passes and docks. Bights and bends along coastal beaches provide a staging location for baitfish during different tide stages. This in turn, will concentrate snook. It’s easiest to search for these areas using electronic aerial maps. Timing: Beach snook fishing is a summertime affair. The most consistent fishing will begin in May and remain productive until mid-September. 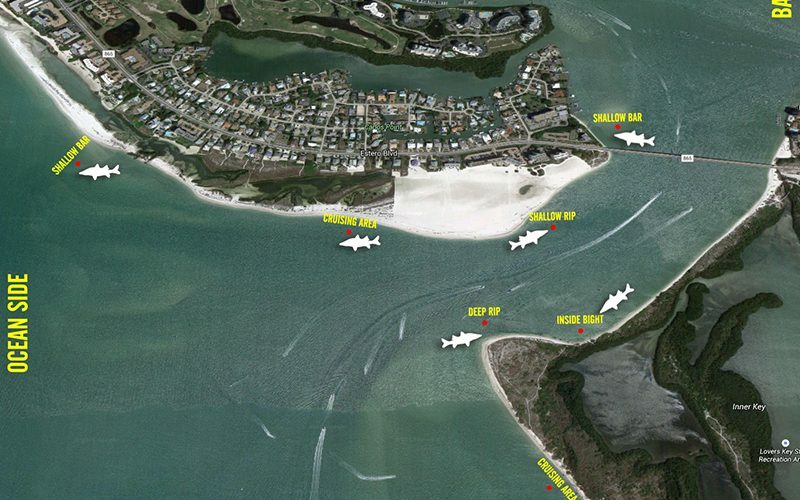 This time period revolves around the snook’s spawning season when large breeding stock collect along area passes and make a short migration a few miles offshore and hold along coastal ledges and man-made artificial reefs. There are several approaches to targeting these fish throughout the day. Key periods offer the best chances for spotting and catching a trophy linesider. Low Light: Is a peak period of fish activity. The ninety minute windows of low light around dawn and dusk can provide the best action of the day. It’s best to arrive on location at least fifteen minutes before sunrise. Not only is it a great time to fish, it’s often very peaceful to enjoy the surf along and empty beach. In populated areas, the bite is usually over by 9am as beach-goers arrive and the jet ski tours begin pounding the beaches, the bite is over just as soon as it began. Watch your shadows: As the sun rises along the horizon, pay close attention to the direction your shadow casts into the water. Beach snook are very wary and will bolt at the slightest sign of danger. Keeping your shadow behind you while stalking the fish will give you a much better chance at success. Tides: There can be some great opportunities to catch snook during the middle of the day along beach areas in the vicinity of passes and inlets. Peak periods of tidal flow will trigger snook to feed regardless of the temperature and sunlight. These times are easy to identify by referencing a tide chart and planning your approach around the top of a high tide and end of a low tide. The best tides to fish can depend by location. Outgoing Tides: Generally, outgoing tides provide an abundant supply of food being swept out to sea from the back country. As this bait is pushed through the passes and along the beach, nearby snook will take advantage of an easy meal. Also, outgoing tides generally push out off-colored water, which can make snook much less wary of artificial presentations. While outgoing tides tend to produce the best, they have some downsides. It’s common for outgoing tides to be full of floating grass and debris, which can make presenting baits a challenge. During these times, it’s best to rig baits in a weedless fashion to prevent fouled hooks. Incoming Tides: I find the best portion of an incoming tide begins about one quarter of the way into the tide change. At this point, the water has begun to clean up considerably from the left over floating debris common during low slack tide. As this water cleans up, it becomes much easier to spot laid-up snook along the shoreline and jetties. While it’s much easier to see the fish you’re trying to catch, snook are much more keen to your presentation and can often be challenging to entice during this time. Employing live baits instead of artificial can make a big difference in the amount of hook ups while fishing clear water. Lures: You’ll need to lighten up your normal offerings successful beach snooking. I prefer to use smaller lightly weighted slender soft baits, like the 4inch and 6inch Hogy Skinny Series. These finesse lures are perfect imitators of the smaller baitfish that are common along coastal beaches. I tend to keep my color selection simple. 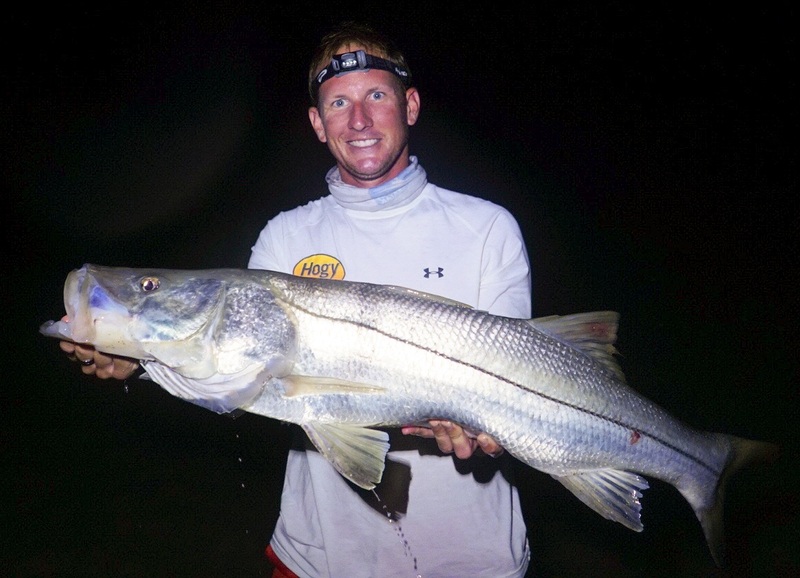 Bone (white) lures work just about anywhere for snook, and beach fishing is no exception. I’ll rig these small soft baits with a 1/4oz swimbait hook rigged weedless. This small amount of weight will give you added casting distance and keep the bait lower in the water column and closer to the bottom where the snook will be staging. 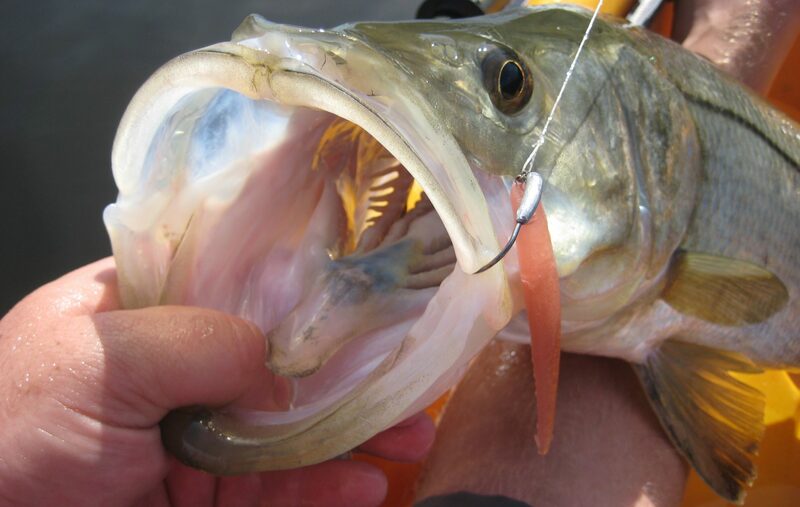 Lighten your tackle: Opt for lighter tackle than normal when targeting beach snook. 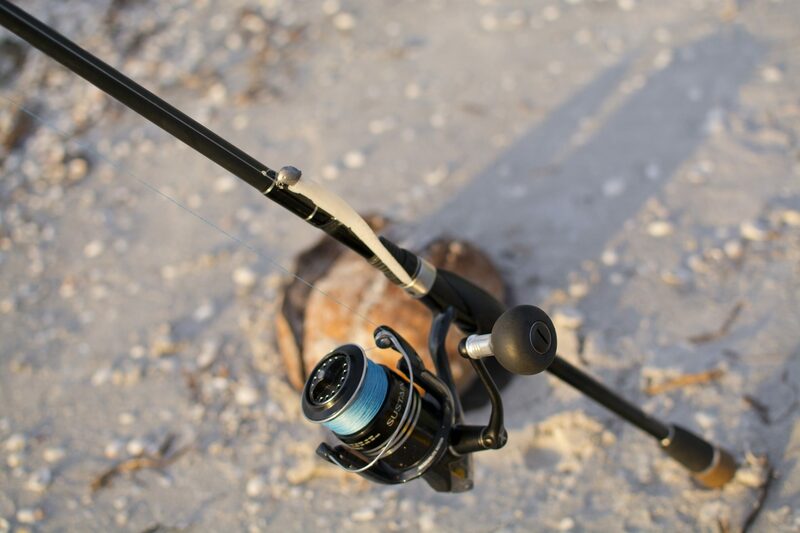 A 10lb – 20lb medium action spinning outfit is ample for taming even the biggest beach snook. Not only is it fun and challenging to fight these fish on light tackle, it also allows you to present small and lighter lures which are preferred along clear, shallow beaches. Leader: It’s best to err on the lighter side of leader for beach snook fishing. While I generally use 30lb to 40lb test leader while fishing heavier structure inshore, I’ll often opt for 20lb – 25lb fluorocarbon while targeting snook in open water. 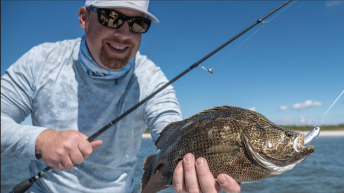 While the beaches will generally be lacking in heavy structure, you will still need to pay close attention while fighting your fish and utilize a lighter drag to prevent chaffing and cutoffs from the snook’s razor sharp gill plates. I like to connect my braided line to leader using a slim beauty knot for an ultra durable connection. Hey Captain Ross, I love the website and all the helpful information you have posted. I too have recently become a tarpon addict, and can’t get my mind off of them. I’m trying to learn as much as I can, and have never seen those hoby protails before; they seem like a great match for the hatch. Anyways, I’m here in South Florida, palm beach area, for another month and have been trying to find a way to hook another silver king. I haven’t been able to get any info or really helpful tips from any local bait shops, and no one really seems to understand these fish quite like you do. I was wondering if you could at all tip me into the right direction? I have my rod and reel, and small cast net, and would like to know if it would be possible to hook one from shore? Or if you do charters and where you’re out of and how much? Anything will help and your time and advice will be greatly appreciated. Wes, Feb-March is a tough time to have a lot of tarpon success in the WPB area. There may be some odd balls hanging around coastal inlets or bridges, but it’s going to be a bit of a needle in a haystack. Your best chances are to head south, towards Miami where the winter tarpon/shrimp run is in full effect. There is a lot of tarpon around the bridges and inlets. If you’d like to do a guided trip, Capt. Chris Britton in Stuart has ways of catching tarpon this time of year and would be a great choice for booking a trip! 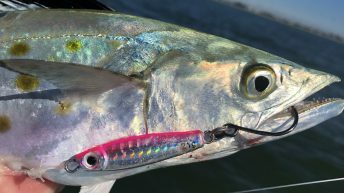 Otherwise, the best DIY tarpon fishing for S. Florida is going to be July – October when the Minnow and Mullet Run bring tarpon into the surf and very accessible to shorebound anglers.